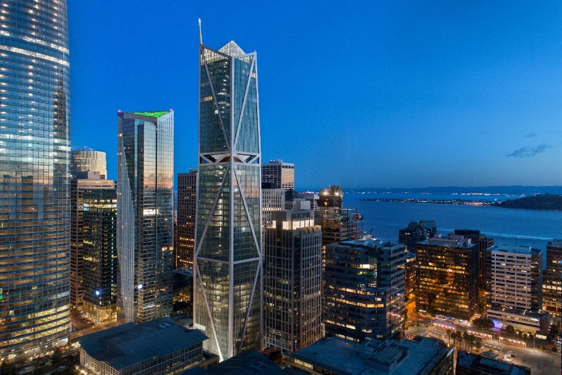 The 181 Fremont Tower is an iconic new, mixed-use high-rise in the dense urban setting of downtown San Francisco, California, that celebrated its grand opening in May 2018. With a roof level at a height of 702 feet (214 metres) and an architectural spire topping out at a height of 802 feet (244.5 metres), the 57-story tower is the tallest mixed-use building west of the Mississippi. The below-grade components for the tower include a five level, 58-foot (17.7-metre) deep basement and 42 drilled shafts extending to depths of approximately 260 feet (79.2 metres) below street grade. 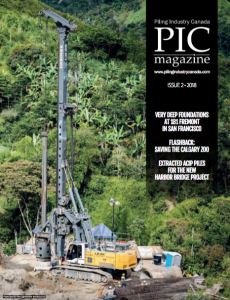 At the time of construction in 2014, the drilled shafts were the deepest in San Francisco and helped to set a new precedent for supporting heavy structures on bedrock in a part of the city where large building settlements have been known to occur. As discussed in this article, the design and construction of the basement and shafts deftly navigated a variety of difficult site conditions and constraints, such as loose fill and soft soils, shallow groundwater, a small project site in a dense urban setting, the proximity of other buildings, and the ongoing excavation and build-out of the adjacent Salesforce Transit Center. 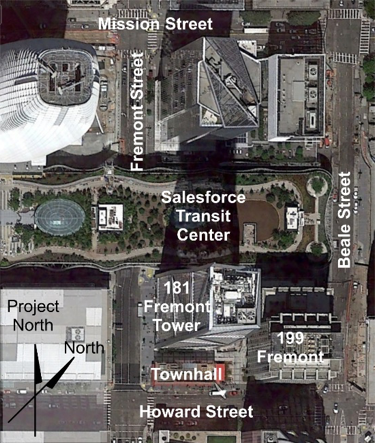 The site is bounded by the Salesforce Transit Center (former Transbay Transit Center) to the north, the 199 Fremont building to the east, the historic “Townhall” building to the south and Fremont Street to the west. The Salesforce Transit Center to the north is approximately 165 feet (50.3 metres) wide, 60 feet deep (18.3 metres) and extends for four city blocks. The above-grade portion consists of a bus-deck level and a rooftop garden, while the below-grade portion consists of an underground trainbox. Due to the shallow groundwater table and the relatively light weight of the transit center, its foundation consists of a mat with micropile tie-downs. At the time of construction of the 181 Fremont Tower, excavation and build-out of the trainbox was underway. The support of excavation for the trainbox consisted of a cement deep soil mixed (CDSM) cut-off wall supported by four levels of temporary walers and cross-lot braces. The 181 Fremont shoring system shared the CDSM wall for the transit center on one side. The 364-foot (111-metre) high, 27-story 199 Fremont building to the east has four basement levels extending to a depth of approximately 50 feet (15.2 metres) below the ground surface. Due to its proximity to the 181 Fremont excavation, the shoring wall for the 181 Fremont basement was placed directly adjacent to the existing abandoned shoring wall for the 199 Fremont basement. The Townhall building (also known as 342 Howard Street or the Marine Electric building) to the south is separated from the 181 Fremont Tower by a narrow walkway that provides access to the 199 Fremont building from Fremont Street. The Townhall building is a three-story masonry building (that has undergone a seismic upgrade) with a one-level basement bearing on strip footings with timber piles. Finally, Fremont Street to the west is a particularly busy roadway that provides access to a large portion of the city from the I-80 off-ramp near the end of the San Francisco Bay Bridge. The project site is located near the edge of the San Francisco Bay and was formerly part of the historic Yerba Buena Cove prior to its reclamation in 1853. Thus, soils underlying the site consist of alluvial sand and clay deposits that alternate due to past depositional changes at the bay margin. The fill material in the upper approximately 15 feet (4.6 metres) is underlain by interbedded marine deposits consisting of soft to stiff clays (Bay Mud) and medium dense to dense sands (marine sands) to a depth of approximately 85 feet (25.9 metres). The interbedded marine deposits are underlain by a stiffer marine clay known as Old Bay Clay (or Yerba Buena Mud) to a depth of approximately 165 feet (50.3 metres) that is relatively homogeneous and slightly overconsolidated. The Old Bay Clay is underlain by a very stiff clay with interbedded sands and gravels that are terrestrial, colluvial, fluvial and possibly estuarine in origin. This layer is referred to herein as “Valley Deposits,” since the presence of some cobbles and large pieces of wood indicate that debris flows likely filled a valley that once existed at the site between Rincon Hill to the south and Telegraph Hill to the north. Franciscan Complex Bedrock was encountered under the Valley Deposits at depths ranging from approximately 222 to 236 feet (67.7 to 71.9 metres). In this part of the city, the Franciscan Complex consists of a chaotic mixture of competent blocks of sandstone, siltstone, and sheared shale floating within a softer clayey mélange matrix. The foundations for the 181 Fremont Tower consist of 17 each five-foot (1.5 metre) diameter drilled shafts, 25 each six -foot (1.8 metre) diameter shafts, a three-foot (0.9 metre) thick mat, and an eight-foot (2.4 metre) wide by 12-foot (3.7 m) deep pile cap ring beam that ties together 34 of the drilled shafts located along the perimeter of the structure. As the mat rests on compressible Bay Mud and the deep shafts provide relatively rigid support to the structure, the thin mat was able to be designed primarily to resist hydrostatic uplift and a small heave load. Large seismic demands necessitate the transfer of loads to great depths to provide adequate resistance. Net unloading due to the excavation and build-out of the adjacent transit centre could otherwise enable movement along a slip surface type mechanism extending from the southern edge of the tower to the northern edge of the transit centre while passing through the bottom of the Valley Deposits. Case studies from nearby sites indicated that shallower pile systems can mobilize creep settlement of the lightly overconsolidated Old Bay Clay under heavy loading. Unlike many conventional high‑rise buildings, the primary structural system for resisting wind and seismic loads at the 181 Fremont Tower relies on mega‑braces located at the exterior of the structure rather than a more conventional reinforced concrete core. This enables the structure to function with a more open floor plan, which is desirable given the small footprint of the site; however, it also tends to concentrate large dynamic loads at the corners of the foundation. Due to the proximity of the property boundary, pile groups placed at the corners would have been subjected to large eccentric loading. Instead, the potential for differential settlement due to plunging of the corner shafts was mitigated by tying the exterior shafts together with the pile cap ring beam. Integral to the design process was the construction of a test shaft that was loaded via bi-directional expansion of a cluster of three hydraulic load cells (i.e., Osterberg cells or O-cells) positioned within the rebar cage approximately 20 feet (6.1 metres) from the shaft tip. The test shaft was not sacrificial and was able to be incorporated as a permanent foundation element at a relatively lightly loaded location with little uplift demand. The design side friction (i.e., the slope of the line on the load-elevation plot), which was assumed to develop within the bedrock, is approximately half of the amount that was demonstrated to develop during the load test. This is to account for the possibility that the chaotic arrangement of competent blocks within the Franciscan Complex Bedrock could have contributed to a high capacity at the test shaft that should not be relied upon elsewhere. However, the higher side friction was permitted at a few locations where the presence of intact sandstone made for particularly difficult drilling conditions. The diameter and length of each drilled shaft was selected to achieve the required ultimate capacity based on the subsurface conditions at the shaft. Thus, on-site observation by the design engineering staff was critical to identify the material encountered during excavation of each shaft so that its tip depth could be shortened or lengthened as required. Despite the small building footprint, the variation in stratigraphy across the site was significant. For example, the depth to bedrock varied by as much as 14 feet (4.3 metres) across the site. 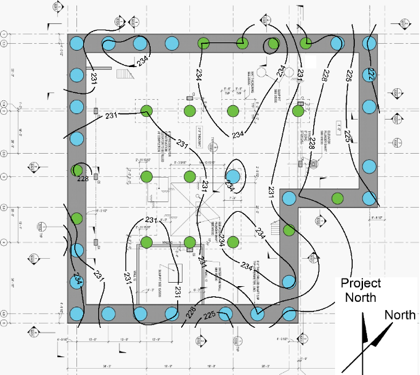 The bedrock contours were updated and distributed regularly during construction to aid in the estimation of required tip depth (and rebar cage length) for subsequent shafts. Malcolm Drilling installed the drilled shafts from the existing grade using a Bauer BG46 drill rig with a 263-ft (80.2 metre) long Kelly bar. Since the overburden soil layers consisted of loose manmade fill, including old wooden piles, and several sand lenses to depths of about 80 feet (24.4 metres), temporary steel casing was used to stabilize these layers during construction. Drilling beyond the casing in the mostly stiff clay layers proceeded using polymer slurry (i.e. drilling support fluid). The Valley Deposits were believed to pose a significant risk to borehole stability due to their loose matrix of gravel and cobble components. Therefore, a higher-grade KB polymer was used because the product allows for immediate slurry enhancement with stabilizing additives when loose soil layers are encountered. Rebar cages had to be spliced multiple times over the borehole since delivery of long cages was not possible. Slurry tanks had to be moved during production and covered to provide some storage capacity. Large deliveries were restricted to limited windows and unscheduled events posed a significant time delay risk. The drilled shaft construction was performed in two shifts, almost around the clock, in close collaboration with the general contractor. The shafts were completed ahead of schedule and no anomalies were revealed by the integrity testing via crosshole sonic logging (CSL). The success of the drilled shaft installation is attributed to the close collaboration between the engineers, general contractor and specialty foundation contractor, as well as the focus on shaft cleanliness.